The chemical composition of the quills includes cinnamaldehyde, gums, tannin, mannitol, coumarin, calcium oxalate, aldehyde, eugenol, pinene, and minerals. Sri Lankan cinnamon is easily ground into a powder, whereas the tough and woody texture of other species can damage the grinder. Once ground, however, it is difficult to distinguish the origin of the cinnamon. Three essential oils are extracted from cinnamon trees: eugenol from the leaves, cinnamaldehyde from the bark, and camphor from the root. Leaf oil yield is 0.7–1.2 percent, and the eugenol is used to synthesize vanillin and converted into iso-eugenol for use as a flavoring in confections. Because of its warm, spicy, and harsh odor, this oil is also used in soaps, perfumes, and insecticides. Bark oil is extracted by steam distilling bark, twigs, and chips. The essential oil content in the bark varies from 0.5–2 percent. The oleoresin contains volatile oil, fixed oil, and other extracts and is used to flavor food and soft drinks, as well as dental and pharmaceutical preparations. It is less popular in perfumes, because it is a skin irritant. Its aroma, which is rich in cinnamaldehyde, is delicate, sweet, and pungent. The seeds contain about 30 percent fixed oil, obtained by crushing and boiling the ripe fruit. This oil is used in India for candle making. A gum or resin is also extracted from the bark with the help of organic solvents. A cheaper alternative to cinnamon leaf oil is clove leaf oil. The medicinal properties of cinnamon have been scientifically studied, and preliminary results suggest it has antidiabetic properties (Ranasinghe et al., 2012). Other studies indicate that cinnamon can reduce cholesterol, thus making the species cardio-protective (Shan et al., 2007). It is used as a tonic and sedative in childbirth. When applied to the skin, cinnamon oil causes blood to rush to the applied area, which helps nourish the skin and produces a tingling sensation. It also produces a temporary plump look that minimizes wrinkles and lines, especially around the eyes. Applying oil with a few drops of cinnamon essential oil helps relieve itchy scalp and acne. The bark has astringent, antiseptic, antifungal, carminative, antioxidant, antimicrobial, and stimulant properties. It is used as a remedy against colds and digestive ailments like diarrhea and colic. 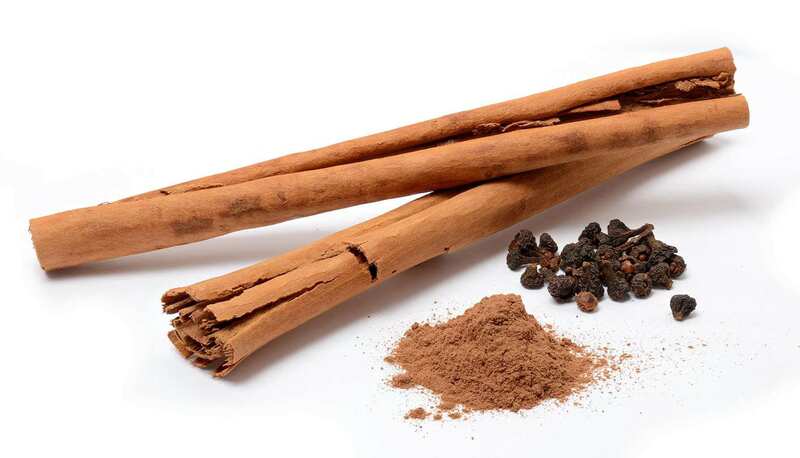 In European phytomedicine, cinnamon bark oil (0.05–0.2 g daily intake) is used in teas and other galenicals for appetite loss and dyspeptic disturbances. The maximum permitted level in food products is 0.06 percent. Sir food level permit is 0.6% Cinnamaldehyte?